Motorola just unveiled that customers in the US will be able to pre-order the Moto X Pure Edition starting tomorrow, September 2. As you may know, the Moto X Pure Edition is the same device that's sold outside of the US as the Moto X Style, and is Motorola's newest flagship smartphone. Prices for the Moto X Pure Edition will start at $399.99 (unlocked, compatible with all major US carriers). The price includes various customization options, though fancy stuff like leather or wood rear backs will cost extra. Motorola doesn't say when the new handset will start shipping, but this might happen before the end of September. Compared to the Moto X (2014), the Moto X Pure Edition brings improvements on all fronts (that is, of course, if you consider a larger display an improvement). The new Motorola flagship is splash-resistant, sports a 5.7-inch display with 1440 x 2560 pixels (Quad HD), and unsurprisingly runs near stock Android 5.1.1 Lollipop (an update to Android 6.0 Marshmallow will definitely be available at some point). Powered by a six-core Snapdragon 808 processor, the Moto X Pure Edition further features a 21 MP rear camera with dual-tone LED flash, a 5 MP front-facing camera with its own LED flash, 3 GB of RAM, microSD card support, and a 3000 mAh battery. Will you be getting one? Im really excited for the reviews to come out! The PURE is a game changer. I will NOT buy another phone unless it will work on all 4 U.S. carriers. But, the lack of a removable battery and fingerprint scanner kills this phone for me. But, if the Nexus 2015's and the LG G4 PRO does not have both, I will probably buy the PURE. The one thing that I am sure of that the battery will be very avg. I want to know how 808 will handle Quad HD. Well, the G4 is somewhat smoother than the S6, so it might depend on optimalization. No, the s6 is smoother and I have both phones. How do you measure "smoothness"? My guess is that in normal usage and browsing it'll run without so much as a hiccup. 3D gaming might not be its forte though. Priced to sell for the US market. Moto is still trying to get its groove back vs. Apple and Samsung here. Off topic but, PA, your site is littered with too many ads now! It's getting to a point where it is starting to get annoying. You'll start losing readers if you keep it up. PhoneArena is the reason I installed AdBlock. Me too. LOL PA makes AdBlock necessary. PA is greedy. Like apple. So all of these web sites provide tons of information to us every single day completely free of charge and the only thing that we have to do is look through (or click past) the ads because it is the sole way that they have to make money at this point. Yet somehow that is being greedy. -_- As readers, there has to be a point in which we realize that none of this comes out of the air and it all has a cost. It is amazing to me that we expect music, information, and almost everything else to be free. But we also don't want to do deal with the one thing that makes all this stuff "free" in the first place. Especially since the cost of advertising on the web is falling, which more or less means that companies are going to have to have more ad space on their pages in order to make up for that. That being said, it would be nice if Phone arena didn't have that stupid popup window whenever I clicked on a new article. I would agree on that. The design of moto phones have started to look boring. Hopefully they will bring about some change next year. I really wanted to get one, but without the option of a payment plan or carrier subsidy, I don't know if I'll be able to. I may have to get the Droid Turbo. I may have to see if I can do this then. I passed on the Turbo because I was waiting for this phone. 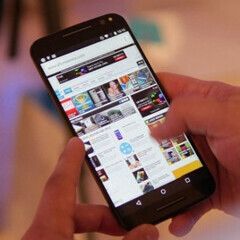 This phone can be a very good alternative to the upcoming Nexus.. I'd argue that Moto Voice and Active Display make it better. Depends whether Moto's new camera jujitsu can equal or better OIS on the Nexus. Do we know for certain that the new Nexus has OIS? From all I've heard, they're kind of stripping down the device to make it more affordable (at least for the LG Nexus). So it's very possible that they might drop OIS to save money.